GTA condominium buyers who are downsizing are looking to purchase units in their current neighbourhoods, giving rise to buildings in the suburbs. Many homeowners in the suburbs are selling their homes and moving into suburban condos, also with their children, who are puchasing their first home. 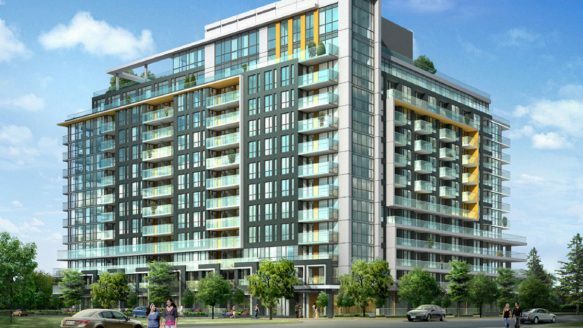 The downsizing homeowners who’ve been purchasing units at The Essential, a six-storey condo project in Markham, have got it made, says Mark Cohen. “They’re selling their homes, putting a pile of money in the bank, buying a condo and living their lives differently,” says Cohen, a principal with The Condo Store, the firm handling sales and marketing for The Essential, a 186-unit development by Emery Homes near McCowan Rd. and Bur Oak Ave.
Condos at the project — which range from 540-square-foot one-bedroom units to 1,252-square-foot two-bedroom-plus-den suites — are priced between $240,900 and $519,900. This makes them a palatable proposition for move-down buyers. Considering suites at The Essential are more affordable than equivalent-sized condos in Toronto — and with many of the same amenities one might find in a downtown project, including a gym, rooftop terrace and party room — the project is also proving attractive to first-time buyers who can’t afford a detached home in the area. 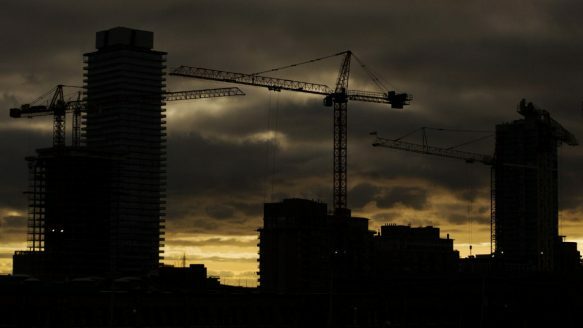 It’s been the same story across the GTA in recent years, where countless condo projects have cropped up in response to provincial legislation that’s pushing for intensification of the region’s existing urban areas. 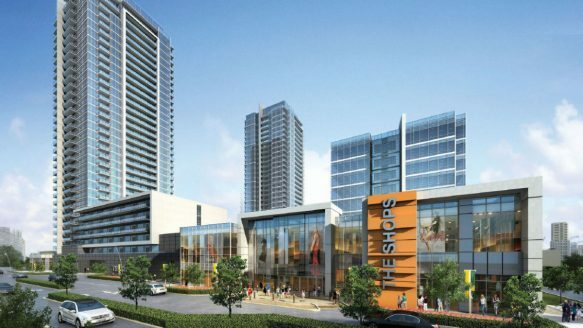 In suburban centres such as Markham, Vaughan, Etobicoke and North York, these new developments boast the trappings of downtown condos — with sophisticated designs and ample amenities — but offer move-down buyers and first-time purchasers more square footage for less cash compared to their city-centre condo counterparts. That’s certainly a big reason why Centro Square has been among the more successful 905 condo projects to launch this year. 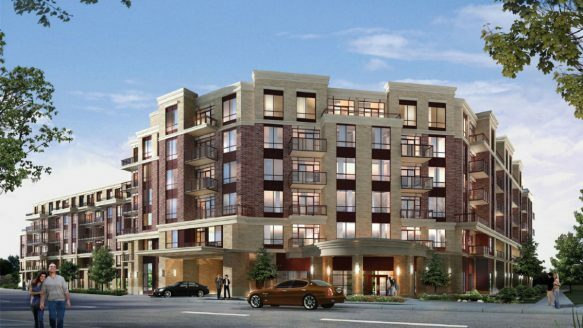 “You’re getting a larger space here for two-thirds the price of a downtown condo — probably $100,000 less on average,” notes Marco Filice, senior vice president of Liberty Development, the builder of the two-tower, 800-unit project at Highway 7 and Weston Rd., on the edge of Vaughan’s burgeoning metropolitan centre. Seventy per cent of the units released in Centro Square’s first tower — which has 447 suites that range from 450-square-foot studios to 1,140-square-foot two-bedroom units — sold within the first two weeks of going on sale, testament to the local demand for condos. While Vaughan’s detached homes and townhouses are priced out of reach for these buyers, “Centro Square offers condos that are affordable (starting in the low $300,000s) and located along Highway 7, near the (soon-to-be-expanded) subway, retail and transportation,” Filice says. At Cloud9, a 12-storey, 260-unit development at Kipling Ave. and Esther Lorrie Dr. in Etobicoke, low prices have turned condo purchasing into a family affair. “We’ve had buyers who’ve bought a suite for themselves and bought an additional suite for their (grown) children to move into,” notes project developer Larry Blankenstein, president of Lash Group of Companies. The development went on sale last year and is currently 50 per cent sold. Sixty of the remaining suites — which range from 515-square-foot one-bedroom units to 920-square-foot two-bedroom suites — are priced under $250,000. Cloud9 offers many of the amenities buyers might expect find in a typical downtown Toronto condo, including a rooftop terrace, indoor pool, fitness centre, party room and guest suite. Like the aforementioned projects, Gramercy Park, a 512-unit condo on Wilson Ave. near Allen Rd., has been drawing a fair share of move-down buyers looking to shift out of their high-maintenance suburban homes and into a carefree condo lifestyle. “You don’t have to care about cutting your lawn or snow removal here,” says developer Rony Hirsch, a principal with Malibu Investments. And with the condos priced about 40 per cent cheaper compared with similarly-sized downtown offerings, move-down buyers can sell their big homes, bank a good portion of the proceeds, and still afford to buy a spacious suite at Gramercy Park, according to Hirsch. The project’s pricing means it’s also garnering interest from first-time buyers, who like that they can get an affordable and decent-sized condo yet still be connected to downtown; Gramercy Park is located beside Wilson subway station. “In 20 minutes you can get from here to Union Station,” says Hirsch. “Downtown will always be more attractive because you are close to everything,” he acknowledges, “but it’s really a question of how much you want to pay. Well, my wife and I sold our Kitsilano townhouse last night. Sold over asinkg after 5 days on the market. We had 3 offers, all over asinkg, all with no subjects. We just set the record in my building (in terms of price-per-square-foot).Our place was spotless, completely de-cluttered, new paint and new carpets, and the asinkg price was sharp. It generated lots of interest from realtors. One potential buyer hired an inspector to check out the building even before placing an offer. The other offers never inspected. The eventual buyer hasn't even set foot in the building.Two units remain for sale in the building-- they've been up for sale for over a month and a half now. There has been interest in them, and they're not extravagantly-priced (perhaps a little high, but not by much), but they're a bit bigger than my unit, so their total price is higher. Perhaps the extra $10K-$20K is just enough that buyers aren't able to make an offer on them.Well, I'm sitting pretty here-- just two months till closing, and there'll be $260K sitting in the bank.